Nokia has announced the pricing of its new Lumia 920 and Lumia 820 smartphones in some of its European territories, though the U.K. was left out. 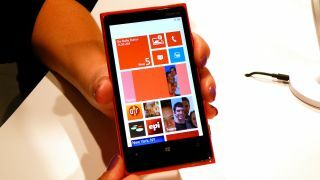 The second tier, 4.3-inch Lumia 820 handset will cost $499 (£396) in both countries, while a November release has been confirmed for both smartphones. Reuters reported that Italian network TeliaSonera will start selling the Lumia 920 on Nov. 12, but that hasn't been officially confirmed by the manufacturer. Nokia said there were no plans to announce U.K. pricing on Thursday, so it remains unclear just how many golden-coloured coins we'll need to hand over to obtain Nokia's first Windows Phone 8 devices. TechRadar has reached out to the Finns for an update and will add details to this story if and when they become available. The ailing smartphone giant is banking on the success of the Lumia 920 and Lumia 820 to enhance its chances of a revival alongside the launch of the Windows Phone 8 platform. The devices will, however, face stiff competition from the HTC 8X and 8S, announced a few weeks ago.